Google may have recruited much of the mobile device industry to support Project Ara, but that hasn't stopped independent efforts to develop modular smartphones. Late last year a Finnish phone maker announced the Puzzlephone, and now another modular smartphone project launched on Indiegogo. 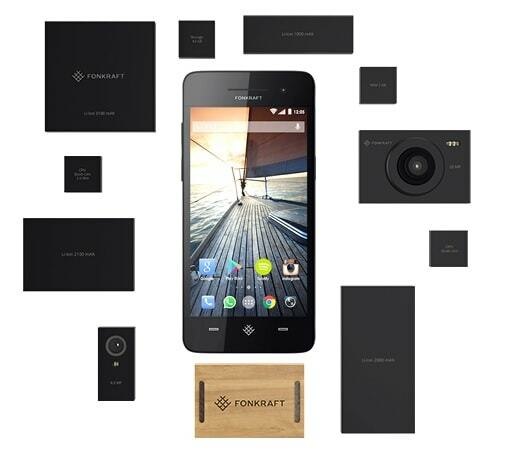 Pitched as the world's first crowd-sourced modular smartphone, Fonkraft is a 5" Android smartphone with a modular screen, CPU, battery, etc. It's built around a frame which will let owners pull individual components and replace them with upgrades, or re-purpose their phones for alternate uses. The Fonkraft is now up for pre-order on Indiegogo. For $99 you can get budget model powered by a dual-core 1.3Ghz CPU with 1GB RAM, 8GB internal storage, and a dual-core GPU. That's not a bad smartphone for the price, and if you want a more powerful unit you can spring for the Fonkraft Resolution or the Fonkraft HiFi. Both models run have a higher resolution screen (1920 x 1080) and run Android on a quad-core 2.5GHz CPU with 2GB RAM, 64GB storage, and a quad-core GPU. The HiFi's design features a high quality speaker unit, while the Resolution has a 20MP camera. They cost $199 each, and according to the Indiegogo listing, that is about half off the $399 retail price. And for those who can't decide on what features they want, there is the Fonkraft Element. This unit comes with all of the components found on either the Resolution or the Hifi, giving you the option of assembling your smartphone just the way you want it. Fonkraft went up on Indiegogo yesterday, and so far the campaign has raised about $700. Assuming the campaign reaches its goal of $50,000, Fonkraft plans to produce, test, and ship its modular smartphones by September 2015. Edit: they were going to get the money either way. I think that is a tad ambitious, don't you? Project Ara has been under development for over a year and a half and it has a lot of smart people working on it, but it still has no firm launch date. And Fonkraft thinks they can beat Google to market? It is entirely possible that a small and focused tech company can best the committee which Google has assembled, but I would bet the other way. Update: And I was right. Indiegogo pulled the campaign. So what do you think of Fonkraft? Are you going to back the campaign? I’ve looked into it. I don’t know what that site is for, but I don’t think that is a real product. I’m going to wait for real news before writing anything. Is it actually a e-ink screen useful in a phone? I am a bit annoyed with my e-reader sometimes because I feel I wait too much when using the dictionary, e.g. I think I will not buy this kind of gadget: I will not pay for things I will not use. Hmm the 200$ models are actually very well priced. The SoC is likely Snapdragon 801 for those, Atom doesn’t clock that high. Looks like they messed up the marketing, getting coverage for the project, since they should have raised millions by now given the pricing. They should have highlighted the 200$ models first since people reading are turned off my dual core at 1.3GHz in the cheap model and might just close the window. If i end up buying this, i’m blaming you lol. It’s actually tempting. I find the $300 model very tempting. If I thought this had a shot in hell of shipping on schedule I would get that one. The campaign was pulled from Indiegogo.